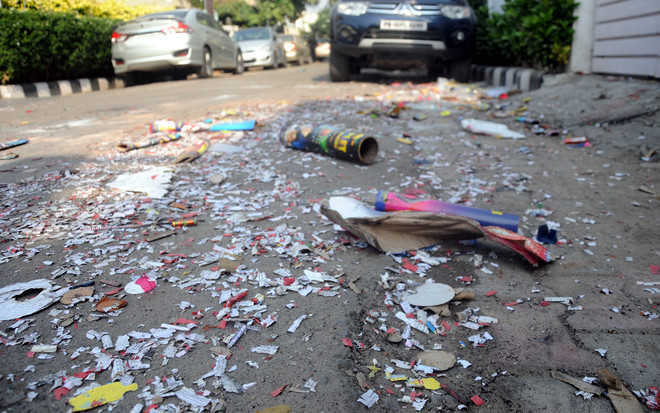 Several people suffered burns while setting off firecrackers on Diwali. As many as 23 injured were rushed to three major hospitals here, Lord Mahavira Civil Hospital, Dayanand Medical College and Hospital and Christian Medical College and Hospital. Besides, many injured visited other hospitals and nursing homes here, sources said. According to public relations officer of the CMCH, a total of 11 patients, mostly children and teenagers, visited the hospital. Of them, five had suffered eye injuries while others had burns on the face or hands. An 11-year-old boy from the Jodhewal Basti area has been admitted to the CMCH with an eye injury. It was learnt that he was setting off a cracker outside his home when he suffered the injury. Many patients were discharged after treatment while the others requested for discharge against the doctors’ advice, said the hospital official. A total of 10 burns cases were reported from the DMCH. According to information, the patients had suffered injuries on face, eye and other parts of the body. “The patients were provided treatment at the OPD. As they had suffered minor injuries, nobody was admitted to the hospital,” said an official at the DMCH. Two cases of burns due to crackers were reported at the Civil Hospital. The Emergency staff said the patients were given the necessary treatment.